Last week's "Fabulous Room" was the bedroom of Boston designer, Nina Farmer whose gorgeous house is featured in the current issue of House Beautiful. As I mentioned last week, I loved the entire house and this week, I just knew I had to feature another one of her rooms. This week, I am loving the airiness of her timeless kitchen. It feels current without being trendy. Quite the opposite-- it's simply classic and chic. You have all of the elements that have been so popular for the past several years-- carrera marble countertops paired with honed black granite, white cabinetry, a stainless La Cornue range (this piece may not be as popular given the price tag, but it sure is highly coveted), white subway tile backsplash, and Circa Lighting's Goodman Hanging Pendants by Thomas O'Brien. Although we've seen all of these elements before, the look is tied together by someone with exquisitely chic taste, so the result is completely fresh and inspiring. I read in the article that you can see the range from the front door, so Nina opted for the stunning La Cornue. How fabulous is that? I guess she isn't one to waste a good opportunity to make a first impression. The kitchen pantry serves as a hub of sorts. It plays double duty, acting as a traditional pantry as well as Nina's office where her design business is headquartered. A clever use of shelving and I'm guessing extreme organization employing the use of classic orange Hermes boxes make the unconventional office space more functional. The space features pendants from Urban Archaeology, a lovely vintage Oushak rug, and a B&B Italia chair. Are you still loving classic white kitchens as much as I am? What is your favorite element in this kitchen? I have a lot of favorite elements in this kitchen. The view from the windows is one of them. (I suspected she was in either Back Bay or Beacon Hill and was right!) Also love her sink--it looks to be made of brass. Stylish! Over in the pantry, I like the pops of color and the pendant lights! I can't get over that hammered copper sink! It's perfect. Her entire house is so chic! That first kitchen is one of my most favorites ever! I think I love the black gridded windows and French door the most. I saved it in my Pinterest kitchen file. White sheets, white towels, white kitchens... always work. 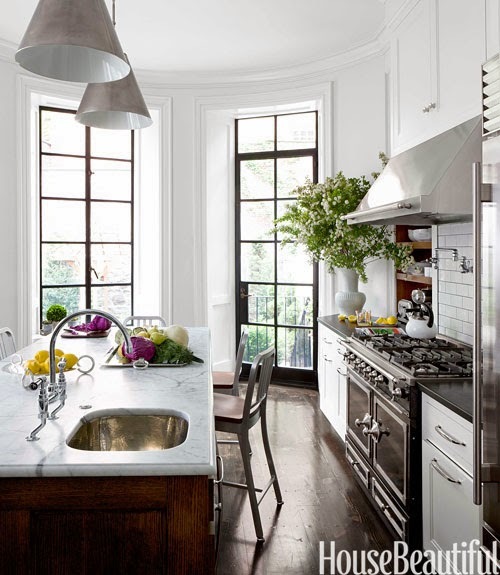 Love the carrara marble and that window and door, I want. That kitchen is so lovely. I just can't stop looking at it. We're looking for an interior designer to do our kitchen. And I'm thinking our breakfast nook would look so nice with those windows! Thank you for the details about the kitchen cabinets. You did a beautiful job with them!